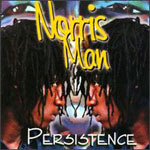 Between the hundreds 7" that came to light at the end of the 90's a new voice emerged: Norris Man with "Bad Road". This is the debut album. Man is quite distinctive and confident on vocals. The duet with Anthony Red Rose on "Heathen Pt 11" is a powerful slow track that expresses Man's beliefs in Rastafari. "Greatest Reward" is another interesting tune with a more joyful approach. "My Happiness" is a hip-hop style tune that shows that is possible to crossover without becoming too much commercial. The album shows a young voice that stays clearly on the right side. What would have made this debut a stronger set would have been less tunes to fill it and more hits.